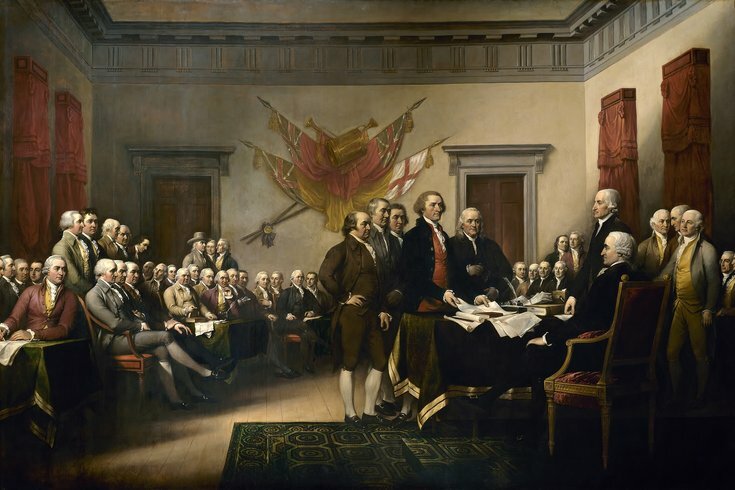 This painting, featured on the back of the $2 bill, depicts the five-man drafting committee of the Declaration of Independence presenting their work to the Continental Congress. How much would you shell out to witness the signing of the Declaration of Independence? That question was posed to 2,000 Americans as part of a survey that asked them to place dollar figures on 40 historical, cultural and personal experiences. They said they would spend an average of $36,836 for the opportunity to step inside Independence Hall and watch the likes of John Hancock, Thomas Jefferson and Benjamin Franklin sign the famed document. That's pricey. But it pales in comparison to the $8.1 million that Norman Lear and David Hayden paid for a rare copy of the Declaration of Independence in 2000. And it wasn't historical experience that captured the highest demand. That distinction belongs to the 1969 moon landing, an event witnessed on television by an estimated 600 million Americans – many of whom are still alive. The survey's respondents would shell out $39,334 to watch Neil Armstrong and Buzz Aldrin take the first steps on the moon. Still, none of the historical events came close to topping the moment the survey respondents said they'd pay the most to experience – again. They'd pay an average of $100,622 to relive the day their child was born. They also would spend $30,256 to relive their wedding day, an amount that falls about $5,000 shy of the average cost of wedding in 2018. Among the more popular cultural events: Woodstock, the Beatles' 1964 World Tour and the premiere of the first Star Wars movie. The survey respondents said they'd pay more than $10,000 to experience each of those. The survey was put together by Bid-on-Equipment.com, an Illinois-based distributor of industrial machinery. See the complete results here.